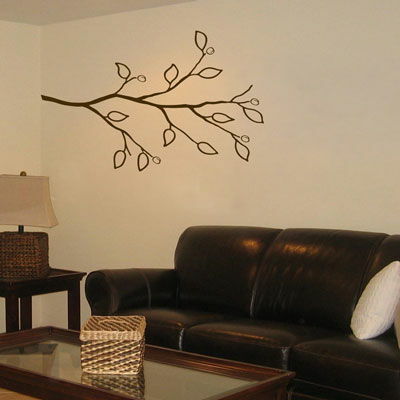 This simple and decorative branch portrays some dainty leaves and little cherry blossom buds. It's shown here in black but available in all of our colors! This cherry blossoms branch measures approximately 37" wide by 24.5" tall. and have already recommended a dozen people to your services. My decal arrived today and I had it up on the wall in a few hours. The whole family is very impressed! We all love it! I can't stop looking at the wall! I am now browsing your website to see what else we can buy. THANKS DALI FOR A GREAT PRODUCT! I have yet to order decals from any company but I have looked at a TON of sites during my search for the perfect decal for our newly painted bedroom in our NEW home!!!! This is the 1st site that has allowed me to change the wall, bedding, etc colors and I have been wishing for this feature since I started my search several days ago! This feature is AWESOME!!! THANK YOU DALI DECALS!!!! I ordered the peacock tree and asked my husband to hang it for me. When I came home, he hung the right side TOTALLY wrong. I emailed to see if I could get just the right side of the decal replaced. I received a response almost immediately. They re-sent me the right side of the tree for only a small fee. What a relief that I didn't have to buy the entire tree again. GREAT customer service. Super fast shipping. Fantastic product. I've purchased Dali decals before but based on the customer service alone, I would most definitely order again!